I was wondering how to move my tactical flashlight so it would be in front of, under, or on top of my fairing. The light is usually mounted on the front deraileur post, but with the fairing on for the winter the light really lights up the inside of the fairing, and that blocks a lot of light from hitting the road ahead. 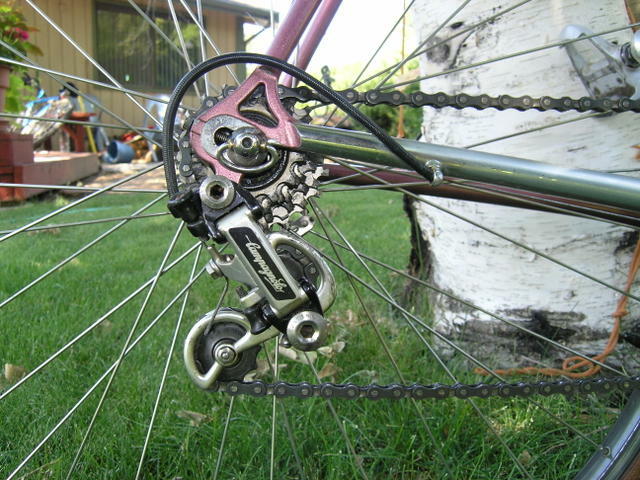 A helpful email from Pat Franz of Terracycle suggested the Terracycle Accessory Mount would probably do just what I wanted. The unit arrived in only about two days after the internet order! I put it on, and it does get the flashlight above the fairing nicely. I’m going to ride it a few days like that, and I think I will try it mounted lower on the fairing frame, maybe even poking through a hole in the fairing. Here is what is looks like mounted over the top of the fairing. It is a bit distracting having that in my line of sight, but I might get used to it. I have been using this light for two years now, through two winters commuting every day in the dark, rain, and snow. I thought I would post an update on the light setup and where to get the components. The flashlight is a Surefire 6P tactical flashlight. It is very solid aluminum, water proof, and a bit pricy at around $50. Mine is a Surefire 6P, and other Surfire models would work such as the SureFire 6Z, C2, M2 and G2 or Cabela’s 6 v flashlight made by Surefire ($32). These models are available from Surefire, Amazon, ebay or Cabela’s. The flashlight comes with an 80 lumen incandescent bulb, which is very fragile, and for my system you take out the factory bulb and replace it with a Malkoff M60 insert. This is an LED bulb with a plastic lens, which boosts the output to 240 lumens, and is apparently an indestructible bulb. My flashlight has hit the pavement at 20+ mph many times, and the bulb is fine. I have a flashlight like this pointing rearward with a red lens, and one pointing forward with a clear lens, and people tell me I’m very visible. The Malkoff M60 insert is available from the inventor, Gene Malkoff, on his website. Many police use a Surefire flashlight with the Malkoff insert. They say “It will easily illuminate objects at 350+ feet and will blind opponents within a 100 foot radius.” It is very visible in the daylight or dark. I take the flashlight camping, and it will light up a mountainside 50 yards away. The insert is $49.95 alone, but this thing is indestructible, and is truly a lifetime flashlight. I have been using the same 17670 AW Protected Battery, one for each flashlight, everyday for a year. They seem to wear out after a year, and I’m on my 2nd set. They are available from Lighthound for $11. I get about 2.5 hours from each charge, and I turn them on day or night, summer and winter, and I charge them twice a week. This is the Malkoff insert, which goes inside the flashlight. I use either a Fenix 360 Bike Mount light holder, $15, this is high quality in fit and finish, but rattles. A small rubber band between the top half and bottom half stops the rattle. A no-name brand is also pretty decent, on ebay for about $10, search Ebay for “New Bike/Bicycle LED Flash Light Mount Clamp Holder.” These are a little loose on the Surefire, so I put a section of inner tube around the flashlight body, for a tighter fit. Charger: Ultrafire WF-139 Charger for 3.7 volt Lithium Battery Charger, from Lighthound.com, $18.00 (charges two of the 17670 batteries). I had a friend get this setup, and on a long bike ride through an old railroad tunnel in northern Idaho, his light was the monster of all the lights in the blackness of the tunnel. I commute on my trike about 355 days a year (all days except when snow is plowed onto the shoulder of the road), and I need to pick up mail, and have sufficient storage to carry my cold weather gear home, on days when I don’t wear it on the ride home. I had a rack, and panniers, and they worked fine, but I wanted something lighter and that didn’t make the Speed look like a utility truck. I got the $14 Nashbars triangular frame bags at Bruce’s suggestion, and they are great for summer commuting. I still needed a little more storage for winter use. I saw all the room under the seat and thought I could use a PVC pipe to use that space. But I found a Pickett blueprint carrier which is very light, and with its screw top lid is totally waterproof. It can carry my rain pants (in stuff sack), my rain coat, gloves, and head covering. They also have extension sections, so I can add another section for longer loads. it would also be perfect for carring lunch, as long as its a round lunch, like bagels, hot dogs, donuts, etc. This tube setup seems light and aerodynamic, and is working well. A stuff sack in the tube. It holds about 3 stuff sacks like this. 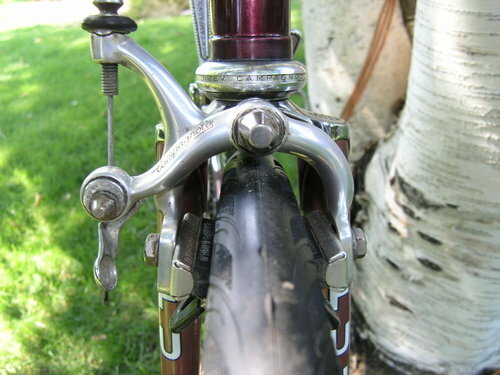 One way to provide some suspension to a bike is to have a seat post with a spring or other shock absorber in it. 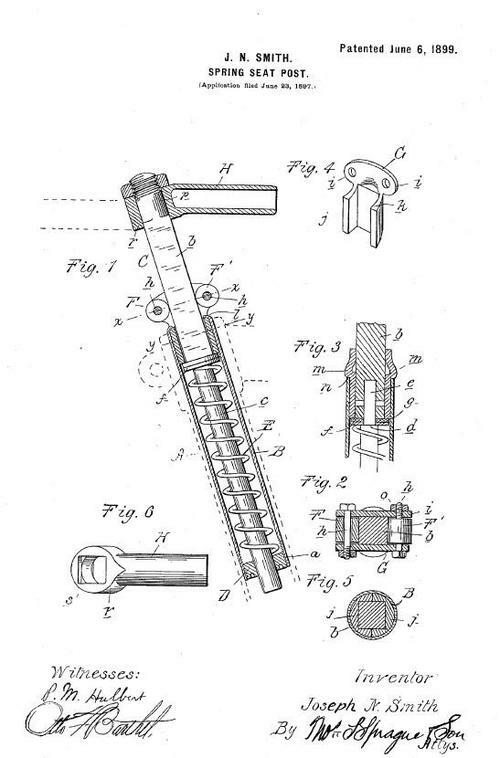 Joseph Smith patented one such device in 1899. Recently my 15 year old daughter has "adopted" my wife’s nice road bike, and has been doing some great rides around town on it. So I thought I’d look for another road bike of about the same size to have a road bike available for both of the ladies in my life. 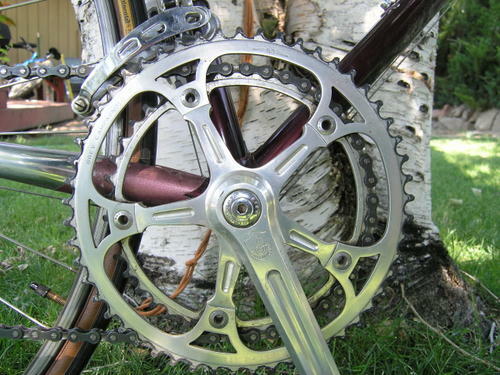 I thought I’d go check out a thrift store bike yard, because my partner Steve found a great mountain bike out there. I went to the bike enclosure of the thrift store, and ran into Steve and his wife Jody, who were scouting for a kids bike. We prowled around together looking for gems, and seeing mostly junk. Steve and Jody left with a nice kids bike, and I saw an aero brake lever on a handlebar, under a pile of nasty bikes. I unraveled the stack of nasty bikes, and got more and more excited as I freed the bike at the bottom of the pile. I saw a Campagnolo brake, then finally got the entire bike free to look it over. 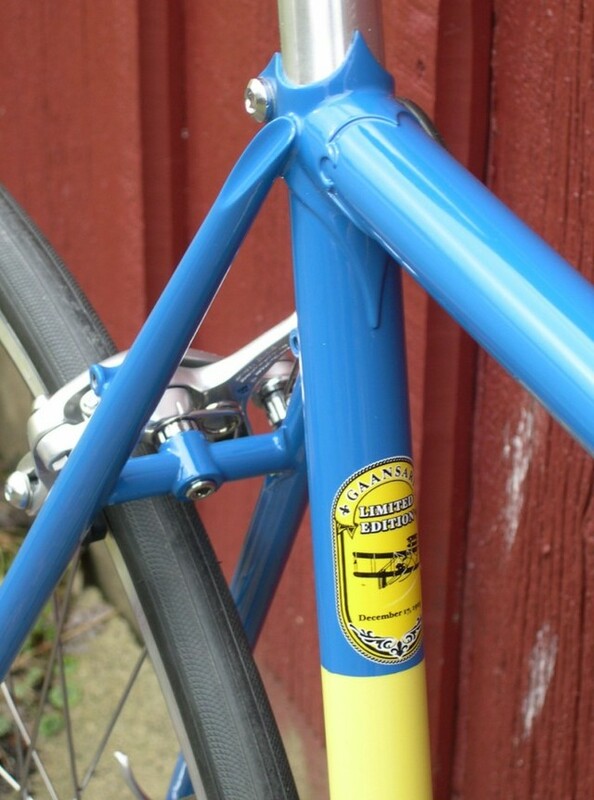 It was a Fuji, with double butted steel tubing, and about the right frame size for my wife. 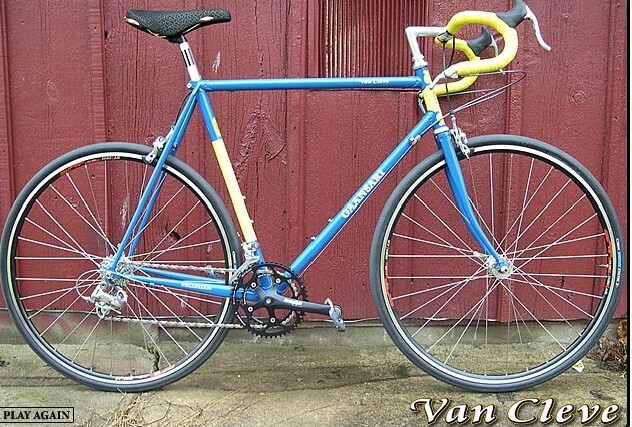 It had Campy hubs, cranks, brakes, headset, shifters, bottom bracket and skewers, and Cinelli stem and bars. 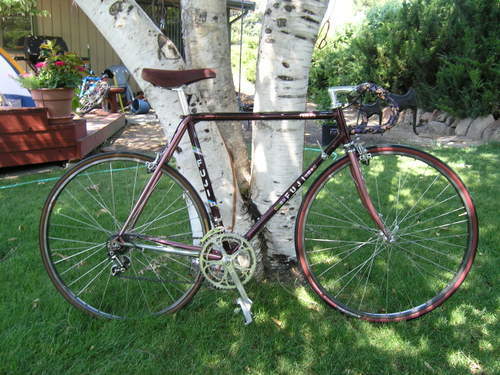 The saddle was suede, and it had Shimano pedals. Since one tire was gone, and it was pretty dirty and greasy, the lady at the gate of the bike yard put a price of $5.00 on it. I tried not to jump for joy, paid my $5, and took the bike home to clean it up. It was like Christmas in July, and with new tires and a little soap, the old bike looks pretty decent. This bike was the JACKPOT! Judging from ebay prices, any of the Campy parts would go for $75 to $125, and the whole bike might run $500+ on ebay.